With a massive scope and tight project schedule with two separate opening dates, Maxwell Floors Ltd. was tasked with the challenge of meeting the need for more than 400,000 square feet of new flooring. Approximately 35,000 yards of NORA Rubber Flooring served as the majority flooring product specified. Before it could be applied, the issue of moisture and substrate preparation had to be proactively addressed. 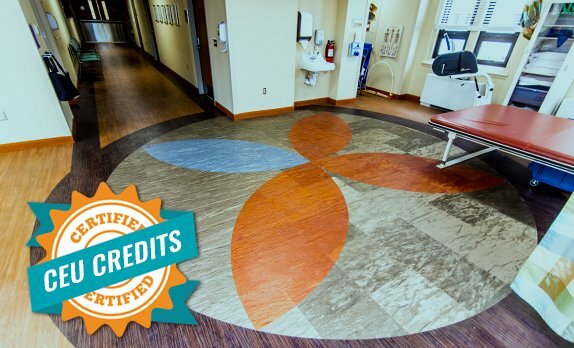 Moisture and substrate preparation is the number one cause of flooring installation failure in the health care industry and may also lead to issues such as mold and mildew which can be potentially life-threatening to patients with respiratory disease. Taking preventative measures, EllisDon and Maxwell completed the project with monthly quality control and performance inspections from all product manufacturers. Additional manpower was required at a time of year when it was not readily available. Because of Maxwell’s association with the INSTALL training curriculum, Maxwell had direct access to the approved manufacturer trainers and was able to invest the more than 12,000 man hours needed to get the job done. The modern design and an unusual interior floor layout, which called for a number of colors, design, accents and seam weld colors, required a highly skilled labor team. The moisture mediation proved to take the largest effort of the project to abrade the surface, apply the moisture barrier and then apply the self-levelling and sloping compound where required. Each of these three stages had to be completed for all 120,000 square feet of the moisture barrier installation. The resilient flooring installation was also not without its challenges. The NORA product required heat and cold weld seams which equated to miles of welding that had to be completed on time, ready for opening day.